Do you need a virtual landline for your business, redirected to your mobile? Would you like a set monthly price that includes all your incoming calls forwarded to your mobile? And with NO long-term contracts? Only €17.50 + vat per month. Call us now to sign up to CALL REDIRECTOR and we can configure you number and call forwarding immediately. Get a virtual number for anywhere in Ireland or transfer your existing number to us. The cost includes unlimited calls forwarded to your mobile. Also included is our free voicemail-to-email feature, so you’ll never miss a call, no matter where you are. If you’d like this new offer then please call us on 015547888 or email sales@goldfish.ie. Want to keep your existing number? You can transfer your existing number to us here. 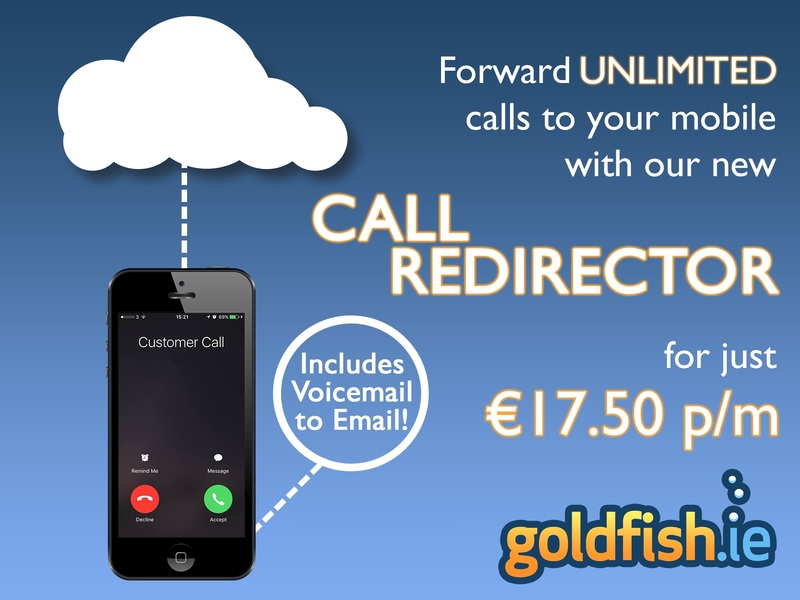 NOTE: This offer covers the cost of all calls that you receive on your Goldfish virtual landline number and then have diverted/forwarded on to your mobile. It is designed a call forwarding services only does not cover the cost of any outgoing calls you make on your Goldfish number. Previous PostPrevious Fail to prepare, then prepare to fail. Next PostNext Goldfish is the first Irish telco to partner with Zoho CRM to launch a telecom integration.